The Next One series is a new and innovative system which provides high flow rates in a quick and easy change cartridge configuration for Point-of-Entry (POE) applications. 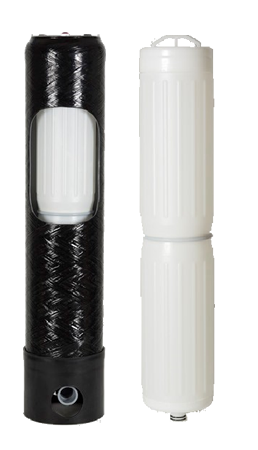 Using this patented industry exclusive liner design and no tools necessary snap-ring design, with full radial seal top and bottom caps, makes cartridge replacement quick and simple. Easy no tools access to remove the old and replace the new cartridge means significant reductions in service costs and reduces down time to just a few minutes. Fully tested and NSF/ANSI 42 listed with NSF/ANSI 61 and BS6920 accredited TAC active scale prevention, The Next One is fully drinking water compliant and can be relied upon to provide safe and efficient water treatment. The Next One series provides safe, efficient, cost effective, low maintenance Point-of-Entry systems which are ideally suited to the food services and hospitality sectors. These systems use TAC scale protection technology independently verified as equal in efficiency to ion exchange water softeners, but providing the major advantage of producing potable safe drinking water. Next One does not use electricity, no salt or chemicals, does not need to regenerate or backwash making it a truly fit and forget system. Point-of-Entry installation removes the need for multiple Point-of-Use treatment devices for boilers and water heaters, coffee machines and brewers, ice machines and other kitchen equipment which needs protection from the scourge of hard water scale. When installed in dual cartridge or dual tank configurations, you have in place, and in a single location, all the options provided by multiple Point-of-Use devices. This means no service engineers in customer facing areas, and no cartridge changes on individual equipment, eliminating down time, and reducing replacement and service charges. Next One is available with a flow recording system which sends an email to a designated service point when the cartridge is ready to change.